Preheat oven to 200°C (400°F). Place the eggplants directly on the flame of a gas burner or the grill of a barbecue and cook, turning every 5 minutes, for 20 minutes or until very soft. Place in a colander and set aside to drain and cool for 5 minutes. Cut in half, scoop out the flesh and place in a large bowl. Mash with a fork, add the quinoa flakes, za’atar and salt and stir to combine. Place the lentils and onion in a food processor and process until smooth. Add to the eggplant mixture and stir to combine. Roll tablespoons of the mixture into balls, then roll in chia seeds to coat. Brush a large oven tray with the oil, place the balls on the tray and cook for 20 minutes or until firm and golden. 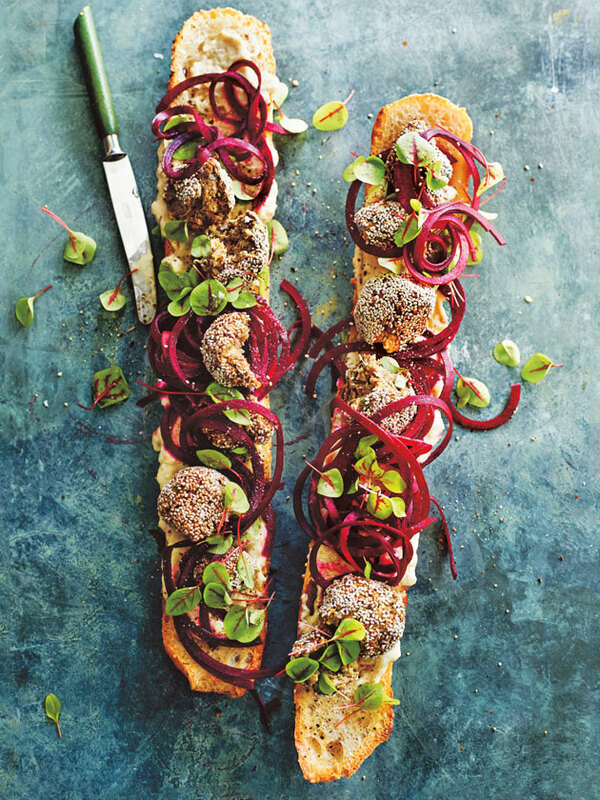 Spread the baguette with the baba ghanoush and top with the beetroot, eggplant balls and sorrel, if using, to serve. Serves 4. + Za’atar is a dried spice mix. Find it in the spice aisle of supermarkets or delicatessens. ++ Use a spiraliser to cut the beetroot. Alternatively, thinly slice into long lengths using a julienne peeler.